The most successful text from one of the biggest names in the field, this fourth edition continues to provide students with clear guidance on the process of doing qualitative research, and has been updated with coverage of devising research questions; new student examples; common pitfalls to avoid; and much more. 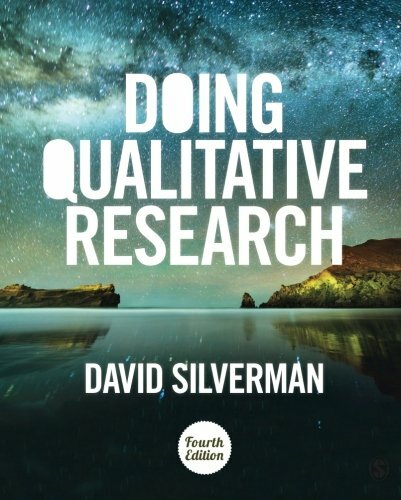 In the fourth edition of his best-selling textbook, David Silverman provides a step-by-step guide to planning and conducting qualitative research. Using real examples from real postgraduate students, the book makes it easy to link theory to methods and shows how to move from understanding the principles of qualitative research to doing it yourself. The new edition has been fully updated and now includes: - a brand new chapter on formulating a research question appropriate for qualitative research - an expanded discussion of the role of theory in research - extended discussion of case study research and the number of cases needed for effective qualitative research - further coverage of focus groups and analysing internet data - new student examples from around the world - a new section on the common pitfalls encountered in qualitative research - an expanded companion website with more student examples and videos. Filled with exercises to test your understanding and develop your skills, as well as David's own tips for research success based on years of experience, this book is essential reading for anyone doing qualitative research. Available with Perusall-an eBook that makes it easier to prepare for class Perusall is an award-winning eBook platform featuring social annotation tools that allow students and instructors to collaboratively mark up and discuss their SAGE textbook. Backed by research and supported by technological innovations developed at Harvard University, this process of learning through collaborative annotation keeps your students engaged and makes teaching easier and more effective. Learn more.